Putting together the bed didn't take much time and it was very stable which i'm glad for. This bed set is perfect for kids and/or teenagers to sleep in, and I highly recommend buy it. The Linden Single Arch Bed features an airy slat design with arching headboard and low-profile footboard. Glossy powder coating provides a lasting finish while full metal construction ensures long-term durability. Simplistic and functional with a variety of colors to suit your style. Dimensions 78.75 In. X 57.0 In. X 36.75 In. Great bed, love the color... But on the mobile site it only shows the twin version. I bought this bed and the matching trundle based on the photos and mention of "matching trundle sold seperatly". 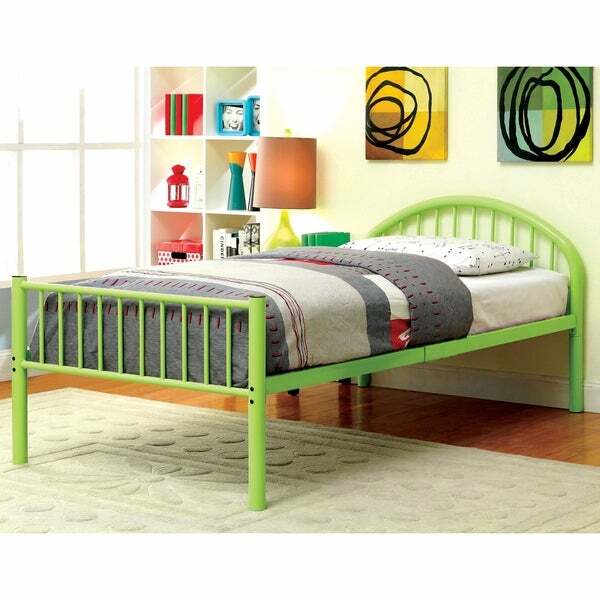 The photo is misleading, the full size bed has middle supports and will not accommodate the trundle underneath. So while it is a great solo bed, I wish I hadn't wasted $*** on a trundle that doesn't fit under it! purchased this bed based on asked and answered questions. please note that the actual dimension between the floor and bed rail is only 11 and 1/2 inches, not 18 inches as described. very disappointing. However, Overstock customer service provided a partial refund for the wrong information provided by their staff. Very good quality. Got bright green for grandchild’s room. I out together by myseld whew! So would recommend a helper or something to hold one end while attaching headboard. Love the color and very sturdy! Son's first "big boy bed"
I love this bed! It was actually delivered a day earlier then stated (yay!) and my husband had it up in about two hours. We were worried we were going to have to buy a step stool for my son to get into bed but they're not needed. The bed is low enough to the ground for him to get into but high enough to have room for storage. It's also sturdy enough to deal with my toddler jumping on it. A beautiful red too. Purchased for my daughter. The perfect size, color, and easy two-person assembly make this one of the best purchases I have ever made. Surprisingly sturdy bed frame. Easy assembly. Would buy again. I purchased two in a full size for my grandkids guest room. They are very sturdy and look so fresh and clean in the grandkids room. It is best to leave the bolts loose as you assemble so everything lines up at the end. When all put together tighten everything. I needed something solid for my son because he destroyed his wooden bed that did its time. The bed did not disappoint in term of its stability and ruggedness for a boy, but came dented, but not something that affected the structure's strength. My son likes it, and it seems that it can hold the next few years of my boy's treatment. All in all, plain, but strong! This is a great frame for our 10 year old. Lots of room under the frame for storage. Very sturdy. Highly recommend. Very cute in white, too. The bed itself is very sturdy, however some of the hole didn’t line up correctly. Also it had a few small scratches. But I will be keeping it. For the price it’s pretty well made. Poorly cut. Holes didn't line up with themselves. This bed is a NIGHTMARE to put together. Hardware does not easily screw into holes. Looks fine put together but we'll see how long it holds up. "How much storage space is there in this bed? Also, it says it's 57 inches wide. Isn't that a little bigger than most full size mattresses? " The clearance underneath the bed is approximately 19 inches high and 57 inches is the overall width of the frame, made for a standard size full mattress. A full size mattress measures approximately 54 inches wide x 74 inches long. "I see that "Details" states the dimension of the headboard at 36.75 " high. What is the height of the foot board? thank you." The footboard is approximately 33 inches high. "I bought this in full size with a twin trundle. The full size has supports for the middle which prevent using a trundle as the trundle cannot be wheeled in and out. Are the center supports required for the full size version and if so how do I use the trundle with it?" Hello JB, we’re sorry, the trundle does work with the full size because of the center support legs. They should not be removed since they provide stability. Thank you for shopping with us! "Is this a full sized bed? The photo looks more like a twin. Just want to be sure." Hello SoccerMom42, this item is a Full size frame. Thank you for shopping with us. "Can i just use a Mattress on this frame or do i need the box springs too?" Hello John, a box spring is not required for this bed. Please let us know if you have additional questions. Thanks for shopping with us.